Recent knitting events have kinda taken the wind out of my sails. After frogging the shawl yesterday, I had to get as far away from it as I possibly could. Granny square afghan in JoAnn’s Rainbow Classic Purl Essence. I had finally gotten to the point where I was successfully completing row after row on my mother’s shawl. I was no longer losing count of the stitches or when I did I figured it out quite quickly and knew what the problem was. I thought things were going well. I felt that I finally gotten the hang of knitting lace. Then I noticed something odd about the veins of the leaves. They were different from row to row. Sometimes they looked like nice. Sometimes they looked quite ugly. I looked at them for a couple of days and couldn’t figure out why they were different. I was sure I had been doing them the same way, every single time. I thought about how sure I was for a while and then thought again about how much trouble I had been having for the last couple of years. Late last night, I was no longer sure. I needed to google the answer but I’d already gone to bed and my laptop was downstairs. I was really too depressed about the whole thing to get up and go downstairs. So, I conjured the power of the Internet on my iPad, googled ‘double decreases look bad’, and discovered that the stitches were supposed to be slipped at the same time. For some odd reason, known only to my subconscious knitter, I changed the way I was doing the double decreases. The symbol is listed in the key as sl2, k1, psso. I went from slipping both stitches at once to slipping them individually and now the leaves that once looked quite nice, look kinda ugly. Apparently, I’ve changed my mind on how to do these decreases several times. Of course, I didn’t notice until I’d done an entire repeat both ways. I have frogged and tinked back the various rows on this damn thing so many times that I really just want to frog the entire thing, hand my mother the rather large amount of money she paid for the yarn and apologize profusely that I am a completely incompetent knitter. This is after trying pattern after pattern and utterly failing. This is after buying a really cool app for my Ipad that was supposed to help my lace knitting. I’ve been taking stabs at turning this yarn into a shawl for YEARS. I really kinda hate this shawl. I don’t want to leave it like it is. I don’ want to frog the entire thing. I don’t want to try to find another pattern. I’m not sure I can make myself leave it like it is and just start doing it correctly. It’s a matter of pride except that I’m beginning to worry that my exhaustion and frustration over this damn thing is outweighing my pride. I really wanted to give this to my mother for Mother’s Day. I really hate this shawl. Today my baby is seventeen. Seventeen years ago was a interesting and event filled time in my life. So many things happened right around that time, good, bad, amazing, and some horrendous. Really, really horrendous. The thing that kept me going, kept me filled with hope and happiness in a situation where happiness didn’t seem possible was this beautiful baby boy. During the pregnancy and just after he was born, I had this amazing depth of inner strength and peace that kept me shielded from the chaos swirling around me. Joshua is the light of my life and I was so grateful to have been able to stay at home with him from the time he was born. He and his sisters are the best things to have ever happened to me. No matter how long you let your beard grow, you will always be my baby as well as the light of my life. I’ve added several more squares to the granny square blanket. I still wish I had some white yarn, but it will still look nice with the yellow. 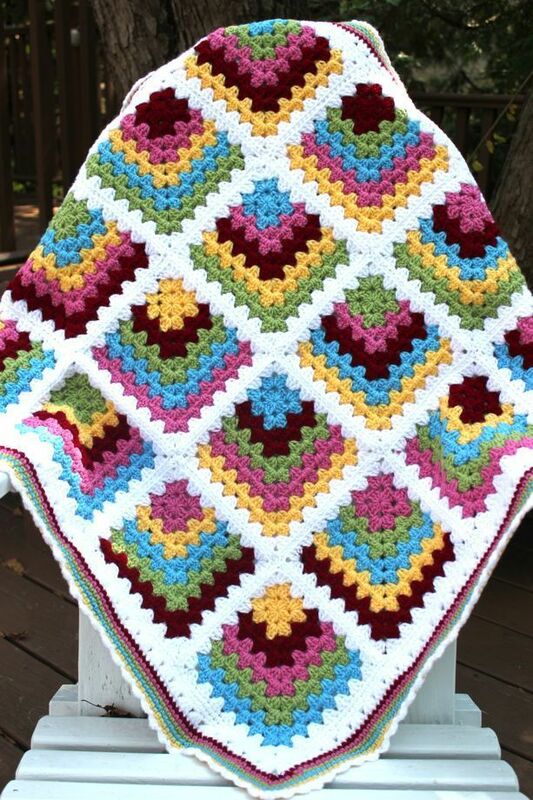 I may have to do this kind of blanket again with a decent acrylic that has all the colors I want. 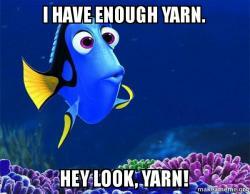 Or I could just go crazy and go get the yarn I want, because that’s just how I roll. I found a creeper chart on Ravelry and will just toss that into the basic hat pattern that I use. I plan on doing a 2 x 2 rib but if I can’t make that work out mathematically then I’ll just do a roll brim.